If you are using a fuel-powered model you might be interested in fuel consumption. So let’s make a affordable DIY-sensor! Arduino Pro Mini 5V 16Mhz (Or equivalent) Example link to Ebay here. Suitable flow sensor, look below. NOTE: Make sure you get the 5V 16Mhz version of Arduino Mini Pro! Flow-module needs 5VDC. Once assembled this will be what you have. I suggest to put the Arduino inside shrink-wrap for protection in the final version. Also if you wish you can put the Arduino on longer wires from flow-module. The Biotech-manufactured sensor Jetimodel uses has a reported range of 15 to 800ml/m or 50 to 3000ml/m depending on model you choose. In this sensor you can use any flow-sensor from BT Bio Tech as long as it has pulse-output and has 5VDC operating voltage. Compare to examples below. Both flow-modules are the corrosive fluid-version so they will take any fuel you give them without damage. Prototype module is from Conrad and is the 15-800ml/m version. 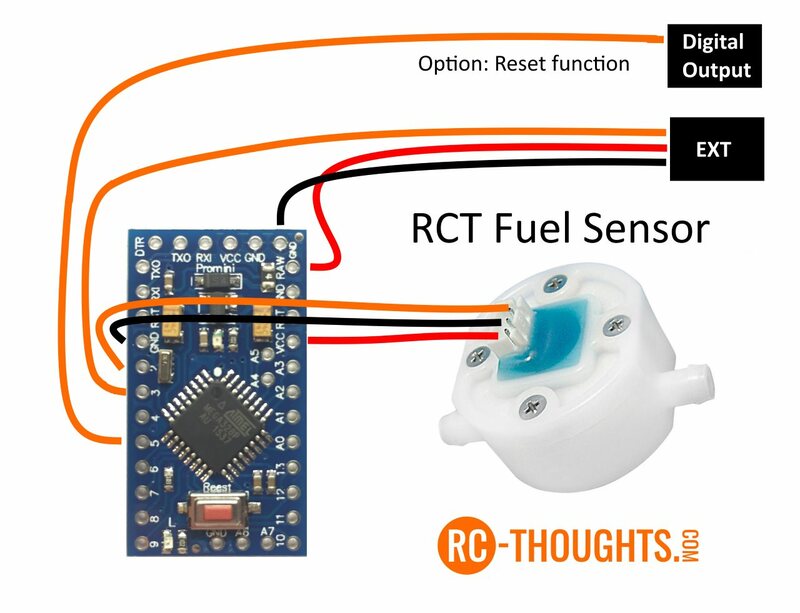 Fuel Sensor works with any 5V flow-sensor! Only requirements are 5VDC operating voltage and pulse output. NOTE: When installing and using the sensor note the flow direction! 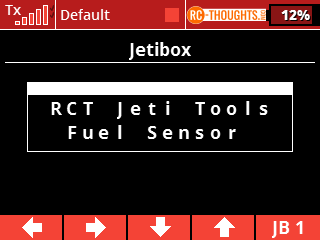 Go and get the suitable .hex or .ino (Named RCT-FuelSensor) file from my Github here. Easiest method is RC-Thoughts Firmware Uploader here + .hex-file. With Arduino and .ino you need to use the libraries included in Github repository. For info on how to use these look in RFID-sensor how-to here. Consumption is reset on sensor power-cycle. If you need to reset it without powering down the sensor it can be done in the next screen to the right. Press Down to reset, press right to move on. 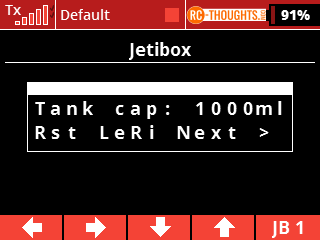 Here is the tank size screen. 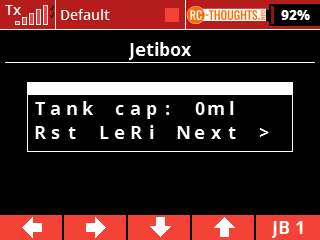 As default tank is at 0ml in size. To increase with a step 1000 press Down, increase with a step of 100 press Up, to increase with 50 press Up and Down. If you miss or need to reset, press Left and Right to reset to zero. After this go to next screen by pressing Right. Next up is the calibration, we need to teach the sensor the amount of pulses it gives when one liter of fuel is used. In first start of sensor or if sensor is reset to defaults it shows calibration value of zero. 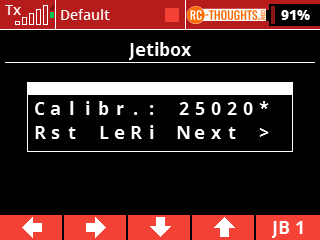 If calibration is done already it shows the *-sign after calibration-value. 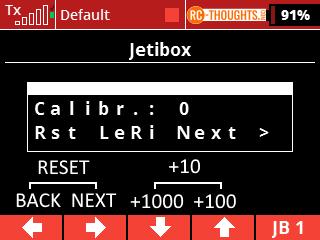 If you want to re-calibrate press left & right to reset calibration-value to zero. 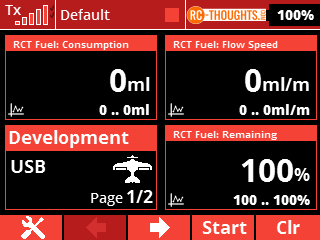 Set your sensor so you can pass one liter (1000ml) of fuel through it. When you have pumped exactly one liter through stop and you should see the amount of pulses your flow-sensor gives with one liter. Pumping speed has no difference as long as it’s around the sensors capabilities. The more accurate you measure the one liter the more accurate the sensor will be in use. Here is my 15-800ml sensor as example after one liter fuel has passed through. After you are done press right, here you need to decide if you will use sensor’s reset-function. 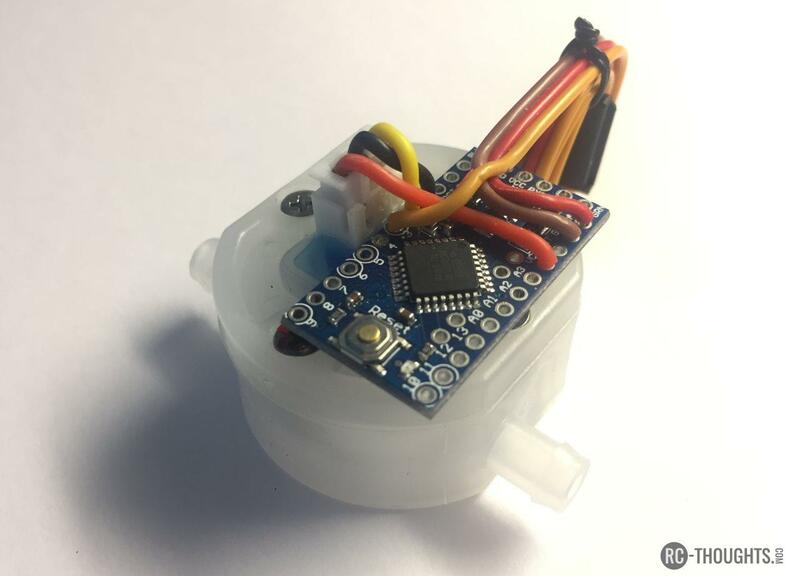 If enabled sensor will store consumed fule-value and remaining percentage after flight. (value is stored after 15 seconds with no flow). 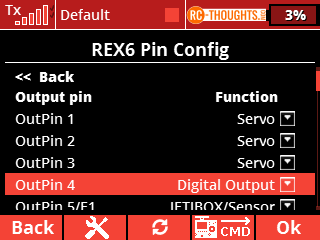 You also need to configure a Digital Output from receiver to Arduino’s pin 5. (Example is further below). Press Down to change between Yes and No. 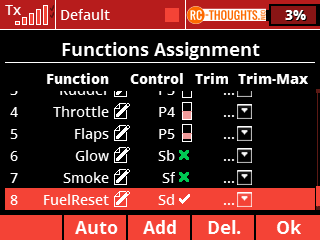 After you are done press right to reset/save-screen. 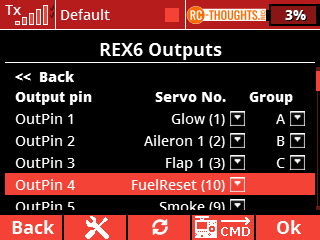 if you want to reset fuel-sensor to defaults (zero-size tank, uncalibrated) press Up and Down at the same time, sensor reset’s and blinks Arduino led once. If you want to save current setup (tank size, calibration,reset-function) simply press right, sensor reset’s and blinks Arduino led once. After saving all settings you’re done! Make sure the channel-value is 100% and goes to -100% on reset. 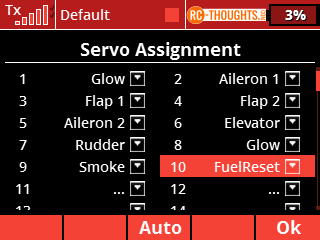 Now you have it, fuel sensor reset with a switch. 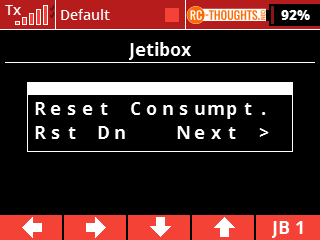 Jetibox-reset is also of course still available. Values in itself are simple. 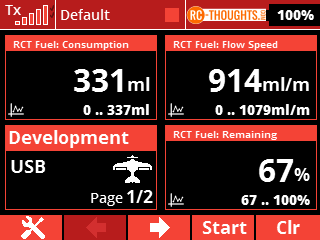 You get the fuel flow meaning how fast fuel is consumed and you get the total amount of fuel used. You can set your alarms any way you like, for example to notify you with “Low Fuel” after 2500ml is consumed. 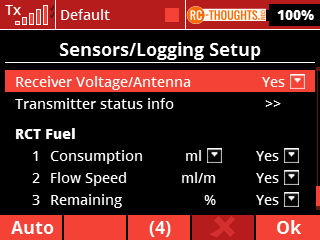 You can also use the ready percentage-value named “Remaining” that tells you in percentage how much fuel you have left. 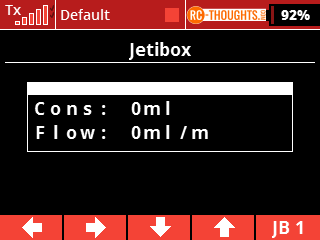 The actual flow-modules are the same module as the on in Jetimodel’s flow sensors. That equals to same accuracy, and with calibration function they are very accurate. 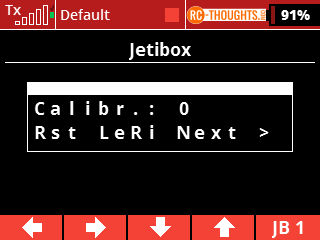 1.6 Changed calibration-screen to show calibration-value if calibration is done.